On second look, it looks like using the images this way would fall under acceptable use... so you could just register an api key. Registering a key is free and takes 2 seconds. Many thanks for the great efforts you already made in developping OPENCPN. I have appreciated all of them but there is a big gap in the track program which works only on detailed charts. I am an old salty dog and most of my cruising friends, and there are many,cannot even use OPENCPN because of this. Same for me . 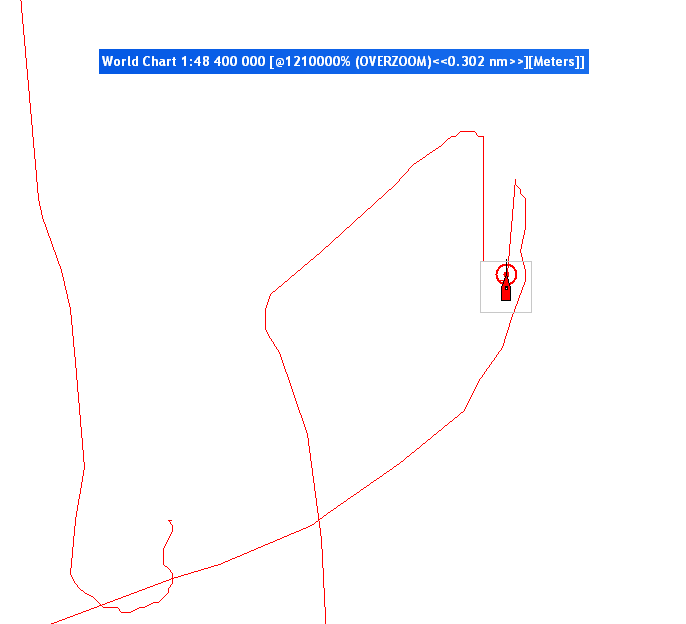 Of course no problem for North America, Europe or other well charted areas, but for world cruising where the charts are large scale, you cannot use the track program which should have a powerful overzoom, a thinner single track, a smaller size of the boat. 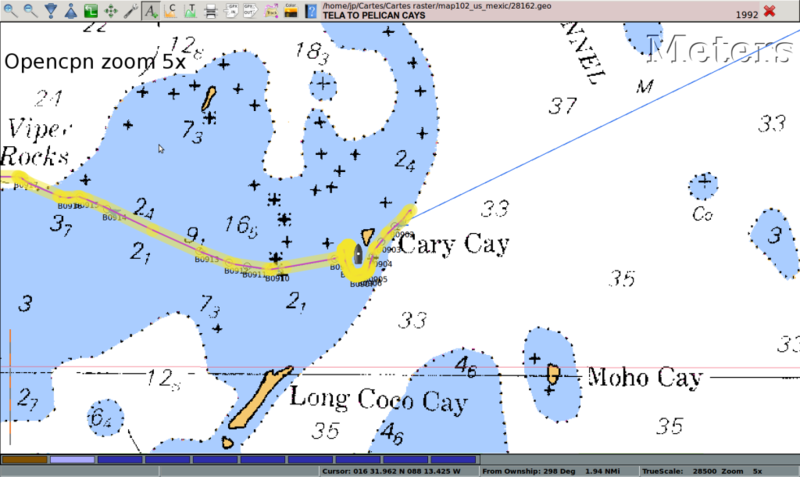 Thanks for developping AIS,the beginnings of GRIB, very useful indeed, but I would appreciate if you could finalize this track program to complete OPENCPN which no doubt is one of the best open source navigation program. Maybe am I the only one to make this request. Never mind, friends cruisers, wake up to help to finalize this track problem, giving your own point of view. I would sincerely regret to have to use an other progran (under Windows ). Thanks for your help and thanks in advance to OPENCPN. Not sure I understand the problem. Could you please try another way to describe the problem with tracks on small scale charts? Maybe some screen shots? The yellow highlight surrounding the track represents a line whose width is 1.5 mm at the equivalent compilation scale of the paper chart. So, if you were to draw a fat pencil line on the small scale paper chart, this is the width of the yellow highlight. It is intended to communicate some sense of the inherent accuracy (or lack thereof) in an overzoomed vector chart. I could of course add an "expert" mode, and turn off the yellow highlite and allow unlimited overzoom. As experienced ECS users, this may be what you want. But I would rather not do this as a default, as entry-level users will blithely overzoom on cm93 and ENCs to the point of pure imagination. As any one made a request for custom keyboard mapping yet? My main reason for asking is that its annoying to have to press 'shift' + '=' to get '-' for zooming out on eeepc, but it would also be nice to be able to set some keys to match the funcitons they have in my other nav programs (old nobeltec and maxsea). That way adjusting into opencpn would a lot easier. And don't forget the anchor watch feature request. That would require to zoom in far enough to see the swing radius at anchor, no matter what chart is being used. I'm having a hard time thinking of any excuses uhum... work arounds for those terms. This way people who like to choose their own destiny in these matters don't have their previosly saved files deleted if boolean accidentally changes. Hmmm... I'll try to think of a better solution as instant, high-res sat-photo charts would be supremely radical. And finally, option 3: Adhere to the spirit of the law and not the letter. We could just do it anyway. Does anyone actually read every jot and tiddle of every EULA? or damage which Google may suffer) of   any such breach. I think they may be talking about me personally here....Or if I was a lawyer, I would certainly be talking about the coder that enabled such a breach. 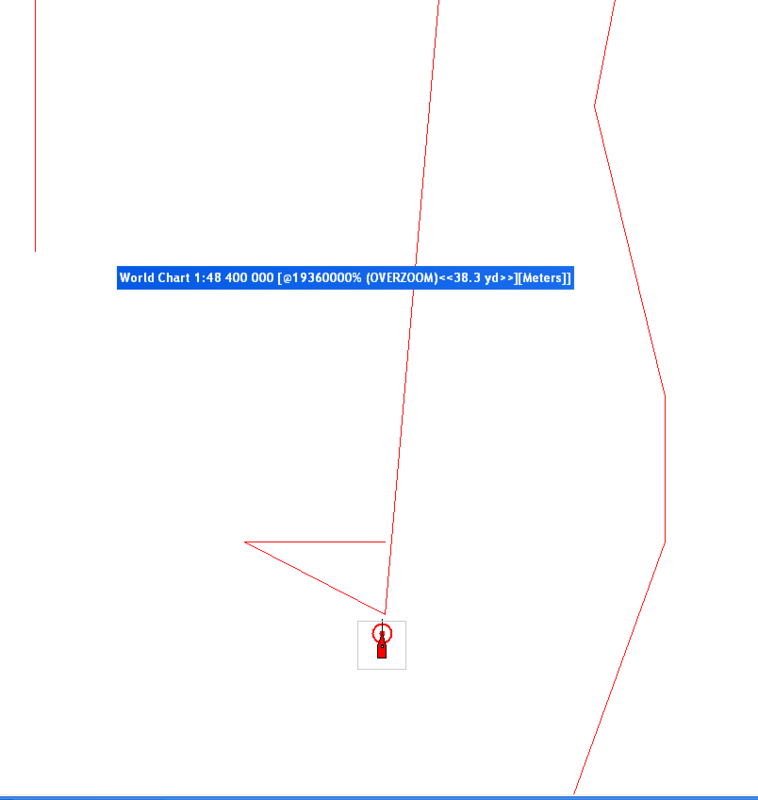 Here is an example with a 1:150 000 chart. 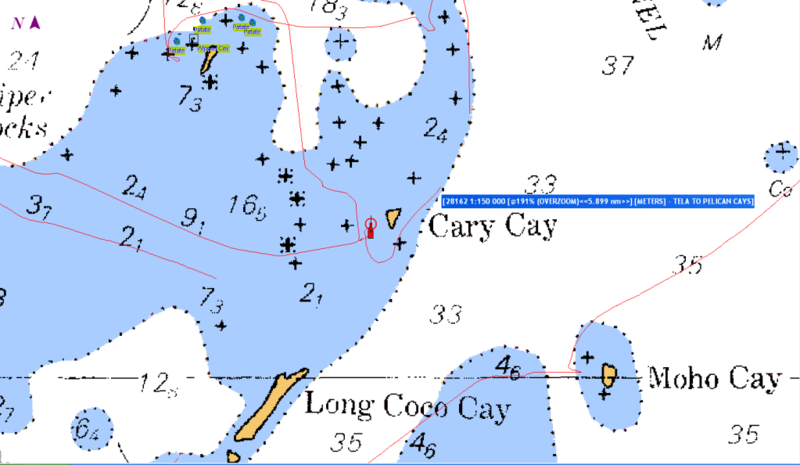 It is the most detail chart I have found for this place, I don't think there is a better one, there are a lot of shoals, corals and rocks and a lot of cruisers are sailing there. It is quite impossible to navigate here when the conditions are not good, cloudy sky, sun in the eyes, night, etc. We absolutly need a very performant track function. Look at the first screenshot : Opencpn zoom 5x, the maximum we can do. The yellow hightlight cover the red line and it is impossible to see it sometimes. The shape of the boat is longer than the small island (nearly 400 yards !) and its width is the same as the island (about 250 yards). It is not clear, it is confused. Now look at this picture with quite the same scale (overzoom 191%) and at the others. I don't change the position of the boat for all them. 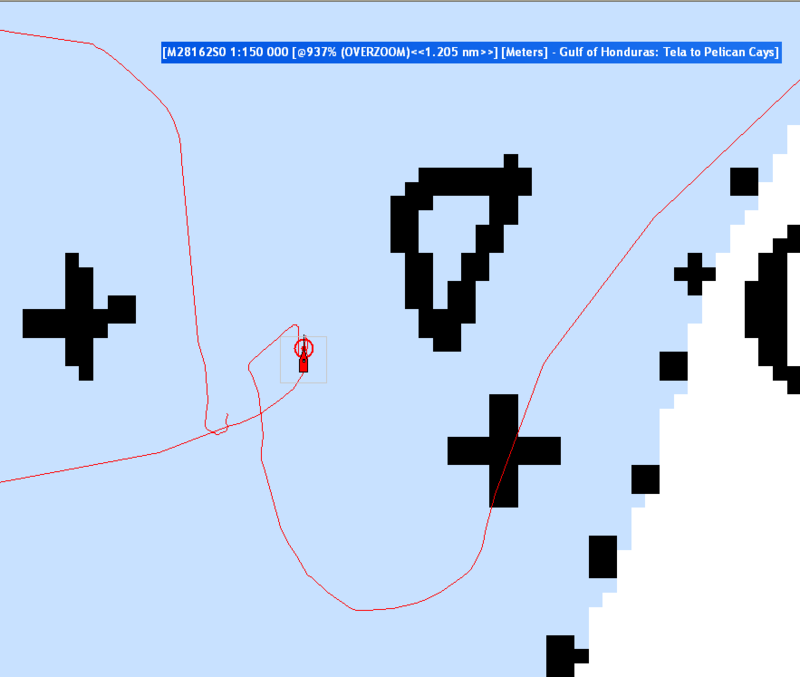 There is only one small red line, no highlight, the shape of the boat is smaller, you can clearly see anything. But neither I would go sailing there in these conditions, I cannot follw safely the track. I hope that it will be enough for you to understand what I was meaning (not always easy to explain what I want in a foreign language ). I understand that it could be an option in Opencpn. Without such efficient function, no possibility of sailing in numerous conditions. Perhaps overzoom could be permitted with a special warning symbol / colour.. I have done a lot of navigation in circumstances you describe, without a gps. I've been i situations where the distance between coral heads is similar to my beam (sure a bit crazy, but I like to explore lagoons). Even with a gps and a chart-plotter on board, I would still keep my eyes firmly on the water. There are circumstances where technical gadgets can't replace eyeball navigation. Why one large yellow track ? only one thin red line as others programs (scannav, seaclear ...) is better.